Hummingbird Nest - the notWildlife Blog - A collection of high quality backyard wildlife photos. This morning I found an unexpected surprise in the patio area... A hummingbird going back and forth, building a tiny nest. I had never seen one in person before and from what I have read about them, I didn’t really expect to find one where I did. The chosen location is just outside my patio door, directly in front of a window, balanced on some unused satellite TV cables. 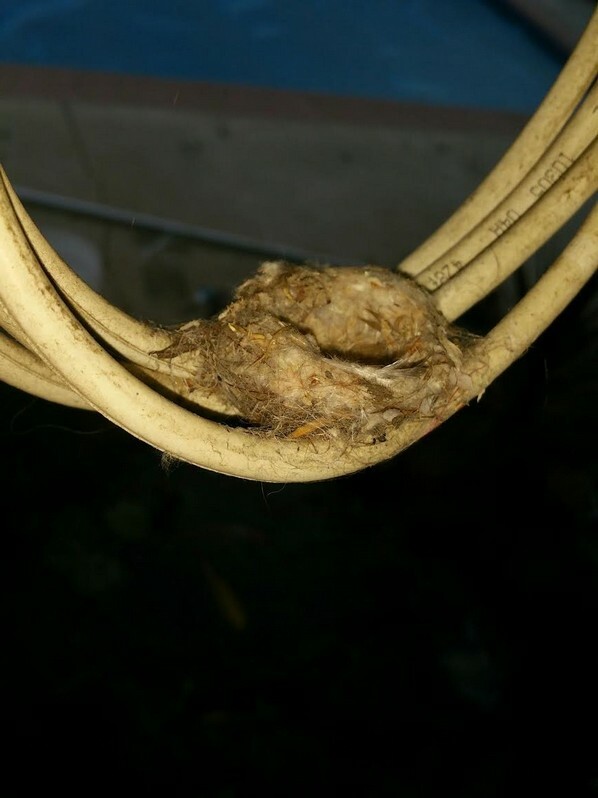 The nest is literally balanced on (hopefully attached to) the cables where they bunch up as they come from the roof and route under the eve/overhang just before they branch out to different parts of the house. This is directly over the pond and only about ten feet away from the hummingbird feeders. Surely the birds “know” that people sit on the patio and play music fairly often. Building a nest directly over a body of water doesn’t seem like the ideal location and surely I read somewhere that they would not build a nest so close to a feeder. I was out of luck as I was running late for work and didn’t have time to grab my camera. I could have used my cell phone camera, but I didn’t want to disturb it by getting too close. I will have to wait until tomorrow to take some photos and upload them here. Update: Okay, so I have been watching this nest for a while now and I have not seen the mother return. I am not sure if she read this blog and decided to move or if it was just practice or anticipatory or what. We had a few days of seriously high winds since I first found the nest. I hope nothing bad happened.